Like most sandwiches, this is a cinch to prepare if you already have the following: hoagie or sub rolls, marinara sauce and meatballs, all home made in advance or store-bought, but..
It’s just as easy if you do it all from scratch in less than an hour (except for the bread, just buy good quality ones ) and it’s more economical too and way more delicious! The recipe below is from Rachel Ray, famous for her 30 minute-meals, so that means it’s quick and easy. But I’m not as fast as Rachel, so it takes me more than half an hour over an hour ( including clean-up ) to make this but the important thing here is the end result..it’s DELICIOUS!!! I just use quickmelt cheese and cheddar cheese in place of the more expensive cheeses in Rachel’s recipe.. and I like to mix ground pork and beef for my meatballs, sometimes I just use lean ground pork..all good stuff 😉 . so delicious and satisying with a glass of ice-cold coke to chase it all down.. yummm-O! Gooey cheese over marinara-covered meatballs. It's worth every step making this super-yummy sandwich. ¼ cup (a couple of handfuls) grated cheese, if you have Parmigiano or Romano..great! Place ground sirloin in a large mixing bowl and punch a well into the center of meat. Fill well with the egg, bread crumbs, onion, garlic, red pepper flakes, Worcestershire, parsley, cheese, and a little salt and pepper. Mix up meatball ingredients until well combined, yet not over-mixed. Divide mixture into 4 equal parts, roll each part into 4 balls and space equally onto a nonstick baking sheet. Place meatballs in oven and roast about 12 minutes. Break a meatball open and make sure meat is cooked through before removing from the oven. Heat a medium saucepan over medium heat. Add oil and garlic. When garlic starts sizzling, add herbs and crushed pepper. Allow oil to infuse for half a minute, then stir in the tomatoes and season sauce with salt and pepper. Bring sauce to a bubble, reduce heat, and simmer until meatballs are removed from oven. 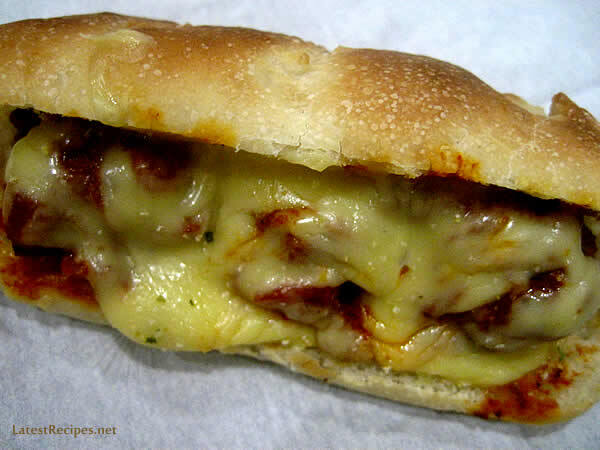 Combine meatballs and sauce and pile into sub rolls, 4 meatballs per sub. Top with shredded cheese and place under subs under broiler to melt cheese. Top with shredded basil or arugula.